Love or hate them, they'll always be around! I just happen to be one of those who adore them... even though I'm pretty sure that they're not ideal for my face shape or hair texture XD! More when it isn't silly-o-clock! If someone can pull off a mullet i think it automatically makes them a legend like they're probably put in a hall of fame or something. 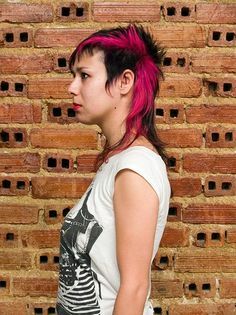 I give kudos to anyone who can pull off a mullet, I personally don't like them on myself and I am fighting that battle right now because I'm growing out a pixie cut so they mullet stage is somewhat inevitable. In my opinion you have to have the right face shape and play around with colors to make it look really sharp. But with that being said I think if you want one then you should go for it! I think having a cut like makes you seem super confident and it can be quite an attractive quality.